The first single, “I Can’t Believe I Found You in That Town,” was inspired by a failed romantic connection in a grim city in the North of England. In a total of about 36 hours, Doughty became enchanted with a woman, came on too strong over Instagram, and then wrote a song about the botched encounter while stress-eating pastry in a pub, then racing back to his dressing room to work out the song on guitar. For the new video Doughty taps into his NYC roots one more time to deliver a sweet tale of young love on the Coney Island boardwalk. All of the classic landmarks are there, like the Wonder Wheel and the Wild Mouse, not to mention a fair share of Mike Doughty t-shirts being worn by men, women, and children of all walks of life. What makes the seaside resort so unique is the people and the diverse collection of personalities that come together each summer to this bohemian paradise. Amongst the crowd is a young couple enjoying the sights and sounds of the night, but most importantly they’re enjoying each other’s company. It’s a little slice of unexpected young summer love and from the boardwalk to the beach it is a perfect sayonara to the summer. As huge Soul Coughing fans, it’s truly thrilling to be a part of the Mike Doughty team. We would love to share all of the goodness that is The Heart Watches While the Brain Burns with you, so please get in touch with us here at HIP Video Promo. You can call (732)-613-1779, email us at info@HIPVideoPromo.com. 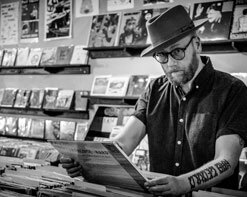 You can also visit www.MikeDoughty.com for more info on Mike Doughty.